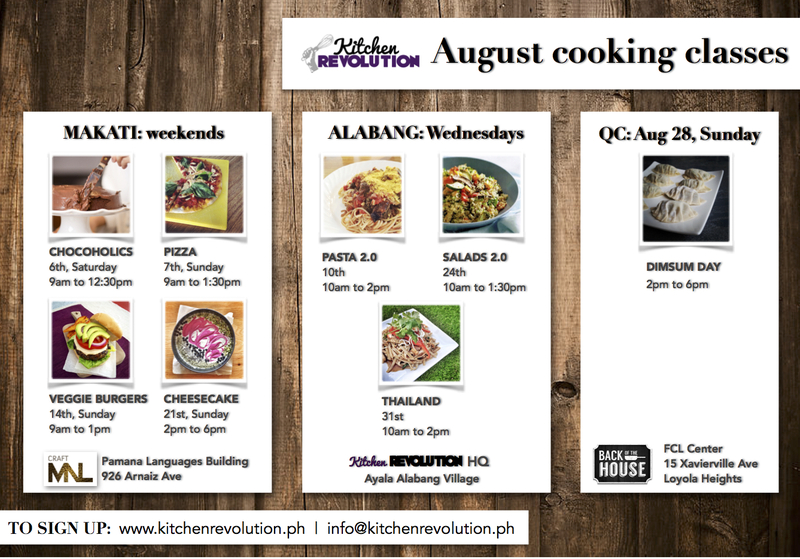 We have 6 cooking classes scheduled for November in Makati. Check them out below! Sign up and pay for 3 classes by November 2, Thursday and get 10% off! Sign up and pay for 1 class with 2 or more friends by November 2, Thursday, and get 10% off! Applicable to Alabang classes, too! Find the November Alabang class schedule here. Who doesn’t love pizza? A healthy diet isn’t drinking green juice and eating salad all day. Guilt-free pizza is definitely achievable in your own kitchen – why pay someone to make you a tolerable vegetable pizza when you can make one (or 9!) yourself that you will actually want to devour? Come to this class and I promise, you won’t find better pizzas around. RATE: P2450 if prepaid by Thursday November 2, P2750 after November 2. NOTE: This class is not gluten-free. Nut-free option available upon request. Bring out your maracas and bandaritas in this fun cooking class! Learn how to make a slew of Mexican dishes for the ultimate vegan party. We’ll make a bunch of stuffings and condiments from scratch, you won’t know what hit you! RATE: P2050 if prepaid by November 9 Thursday, P2250 after November 9. NOTE: This class has gluten-free options. Nut-free option available upon request. RATE: P1950 if prepaid by November 9 Thursday, P2250 after November 9. NOTE: Gluten-free options available upon request. Giving up dairy doesn’t mean giving up on cheese! In this class, learn how to make luxurious and creamy cheesecakes using nuts, wholegrains, alternative sweeteners, and healthy fats. We will be making 4 different crusts as well. You won’t believe it’s dairy-free! RATE: P2450 if prepaid by Thursday November 16, P2750 after November 16. NOTE: Gluten-free option available upon request. This class uses nuts extensively. Chickpea flour is a high-protein and gluten-free flour made from ground dried chickpeas or garbanzo beans. While a staple in Indian, Pakistani, and Bangladeshi cuisines, this flour can actually be used in a number of dishes – proving it to be a useful ingredient to have in your pantry. In this class, learn how to incorporate nutrient-dense chickpea flour in your everyday cooking and baking. RATE: P2050 if prepaid by November 23 Thursday, P2350 after November 23. NOTE: This class has gluten-free options. RATE: P1950 if prepaid by November 23 Thursday, P2250 after November 23. NOTE: Gluten-free option available upon request. Nut-free option available upon request. We have 4 classes scheduled in Makati in June! RATE: early bird rate of P1950 if paid by May 31 Wednesday, P2250 after May 31 Wednesday. Pasta is a staple in Italian cuisine because it cooks quickly and fills up your appetite quite nicely. But most pasta sauces can be quite rich and unhealthy. In this class, discover how to make healthified versions of pasta favourites without sacrificing flavour, using vegetables, soy, nuts, and herbs. We’ve got 4 classes scheduled in November in Alabang – 1 Thursday and 3 Wednesdays. Sign up and pay for 3 classes by November 2, Wednesday and get 10% off! Sign up and pay for 1 class with 2 or more friends by November 2, Wednesday, and get 10% off! Early bird rate of P1950 if paid by Wednesday, November 2, P2250 after November 2. RATE: P1950 if prepaid by November 7 Monday, P2250 after November 7. RATE: P1950 if prepaid by November 14 Monday, P2250 after November 14. RATE: P1950 if prepaid by November 21 Monday, P2250 after November 21. Hello hello! We’ve got 4 Makati classes scheduled this August – 1 Saturday + 3 Sundays. We have 1 QC class and 3 Alabang classes, too! Sign up and pay for at least 3 classes by August 3 and get 10% off! Applicable to any of our locations. In this pastry class, learn how to make more healthful, dairy-free, egg-free, and cholesterol-free variations of well-loved chocolatey desserts. We will be using wholegrain flours and alternative sweeteners in the recipes. RATE: early bird rate of P1850 if paid by Thursday August 4, P2150 after August 4. Paypal / credit card option available, please inquire. Sign up here! RATE: P2450 if prepaid by Thursday August 4, P2750 after August 4. RATE: P1950 if paid by Thursday August 11, P2250 after August 11. This class at Craft MNL in March – full house + full stomachs! RATE: P2450 if paid by Thursday August 18, P2750 after August 18.